A stroll into the garden this morning and my mind became cheerful - roses of five different colors greeted me. I love roses - they are so good to look and beneath the surface, they symbolize the stark truth of life . These beautiful flowers with soft colorful petals growing cheerfully in the midst of sharp thorns - just like how to attain success in life, we need to strive hard and literally walk on a path filled with thorns. Our whole life resembles a collection of hard work and some failures, interspersed with some beautiful successes and joys. Tamilnadu is a state with a very short winter - its cold only towards the end of November and upto early February. Somehow, these rose plants seem to love the cold conditions and there are several flowers in all the rose plants. The plants are also booming with buds. Each day, I await the morning stroll in the garden to catch a glimpse of the roses and count the numbers of these beautiful flowers. 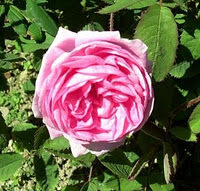 Among the different varieties, I love the 'Paneer Rose' - it gives such a beautiful aroma. Its called Gulab in Hindi and Pale Rose in English. Beyond its beautiful looks and fragrance, the soft and shiny petals of the paneer rose have medicinal properties. It cures stomach aches and clears the intestines from parasites as well. The petals are crushed to make a beautiful scent called Rose Water, which is offered in Abhisheka to the deities in Hindu Temples. paneer rose is the best for fragrance! !